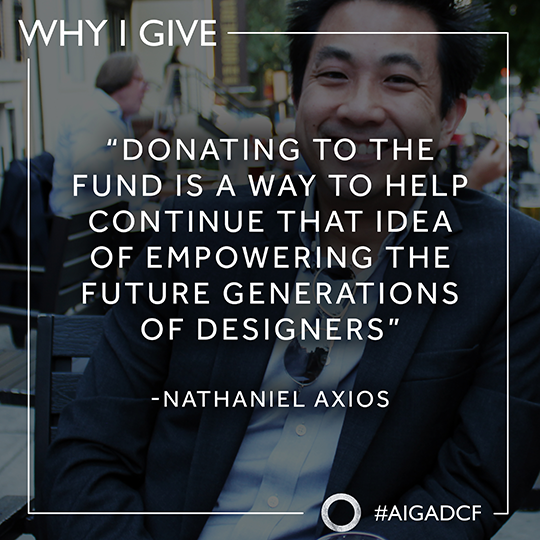 Nathaniel Axios is an Art Director at Deloitte Digital and donor to the AIGA DC Design Continuum Fund. In mid-September, we met with him at Irish Whiskey in Dupont Circle to discuss the benefits of the AIGA DC Design Continuum Fund in helping the future generations of designers. To start, can you tell us a little about yourself and your journey as a designer? My name is Nathaniel Axios and I actually did not start out my career intending to be a designer. I guess, if I go back to academia, I started off as a mechanical engineer. I knew I loved problem solving and making things. Also at this time it was the Dot-com era, which meant CD-ROMs and business cards were everywhere. The new edgy thing to do was to have a business-card-sized CD-ROM with interactive components. You could convey information and also have your portfolio on it. So that’s where I got my start. I made that shift from mechanical engineering to designing in the Dot-com era because I saw opportunities that looked like a lot of fun and paid very well. As designing and creating websites became more accessible, I went that route. I knew that anyone could learn software, but not the actual design theory. That’s not something you just pick up. Some people have a good eye for what looks right and feels right. But design is about problem solving and the theory that goes into it. So once I got out of school, I wanted to explore design in a lot of different spaces for my career. I went from the Dot-com era in a cool design studio to the PR world, to a non-profit, to owning my own little studio working with mom and pop groups. Then I went into the academic arena and got my masters at Rhode Island School of Design. I also met [my wife] Ashleigh there. After grad school, we both made the conscious decision to come down here to DC. Because if you want to make an impact in the design world, DC is where it’s at. It’s one of the major places to do that because of how much public sector work is here. You have the federal government – obviously very powerful – then non-profit associations or citizen-oriented work that can be found in this city. With that in mind, Ashleigh and I moved down here. Currently, I’m back to the core idea of leveraging design to serve. And I’m working for a company called Deloitte Digital. I am an art director and work in a lot of different areas as far as federal agencies are concerned. The diversity is one I really enjoy. One thing you mentioned was the importance of problem solving in design and how that tied back into your education. 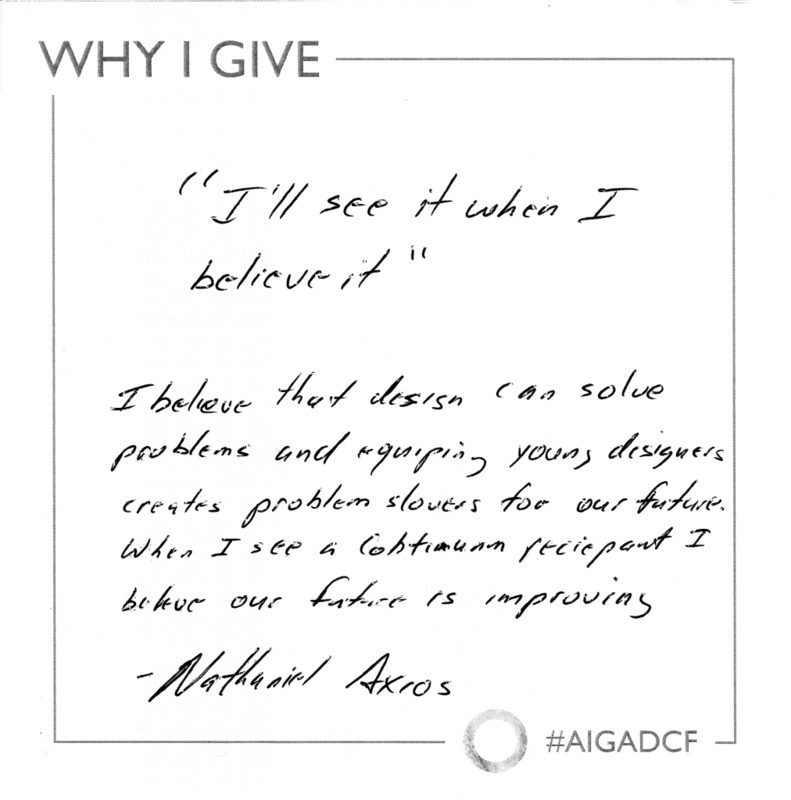 Can you talk more about that and how that inspired you to donate to the Design Continuum Fund? It’s an expensive academic career as an art and design student. It isn’t just design knowledge that you need to latch onto, but the knowledge of how you learn, how you optimize that in order to pick up other subject matters, and how you integrate that into your work. So as a designer, you’re faced with challenges continuously. You’re asked to learn new subjects and the best way to articulate them. Whomever the target audience is, you learn their language and talk to them in a way that is credible. Donating to the fund is a way to help continue that idea of empowering the younger generation, or future generations of designers. Knowing that by giving back I am securing not only my own future as a designer, but the next generation of designers’ future. And that’s the intent. How did you get involved with the AIGA DC Design Continuum Fund? My wife. It was Ashleigh creating awareness around the fund and being on the AIGA DC board. We knew we wanted to make a difference in the world through design. There is more power in a one-to-one contribution and pushing your local community. A lot of students are getting involved in the AIGA DC Design Continuum Fund. What advice would you give to students? So I’ve been thinking about this question. What do you hand down? I do believe there needs to be a legacy from designer to designer to continue to empower future generations. Two points have resonated throughout my career. One is the more you know yourself at the core the less offended you’ll be about what happens around you. This is one of the harsh lessons we learn at school when you put your work up and it’s critiqued. Learn who you are, know what you’re about, value who you are at a higher level. So that when you’re critiqued and when people tear your work apart, that’s ok. They aren’t judging you as a person. The second part is the separation of you – yourself as a person and your identity – and the work you create. As problem solvers, you’re putting out solutions. You’re putting ideas out there with skill, thought, and research. That first solution may not be the right solution. So when it is broken down, don’t look at it as a failure. Look at it as a learning opportunity to figure how to solve problems better and present your solutions in a better light. The core elements they teach you in school are fundamental in problem solving. You need to understand why you use certain typefaces, color theory, and understanding your audience. As you grow up in your career, eventually you’re going to be working with an intern. Remember that intern is coming fresh out of school and they’re going to have to utilize a design system you made. Make sure they understand how to leverage that and be ready to coach them.